Hillsboro’s Mason Swayne floats across the lane on a layup attempt on Friday at Hillsboro High School as part of the 2018 Ohio Valley Hoops Classic. Hillsboro’s Brad Miller shoots over a Wilmington defender on Friday at Hillsboro High School where the teams competed in the Ohio Valley Hoops Classic. 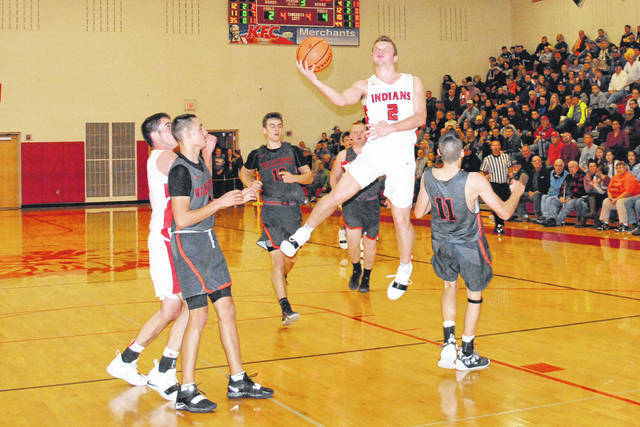 The Hillsboro Indians varsity basketball team got their season underway Friday night as part of the Ohio Valley Hoops Classic when they took on the Wilmington Hurricane in a renewal of a South Central Ohio League rivalry. A tough second half that saw Hillsboro muster only eight points derailed the Indians as they lost to Wilmington 52-31. In the first quarter Hillsboro started strong and jumped out to a 10-6 lead before Wilmington was able to find an answer. But, the Hurricane continued to execute their offensive and defensive schemes and outscored the Indians 7-2 over the final three minutes of the first quarter to take a 13-12 lead into the second quarter. To start the second quarter the Indians were again able to build a small lead at 23-17 before Wilmington fought back to take a 24-23 lead at the half. 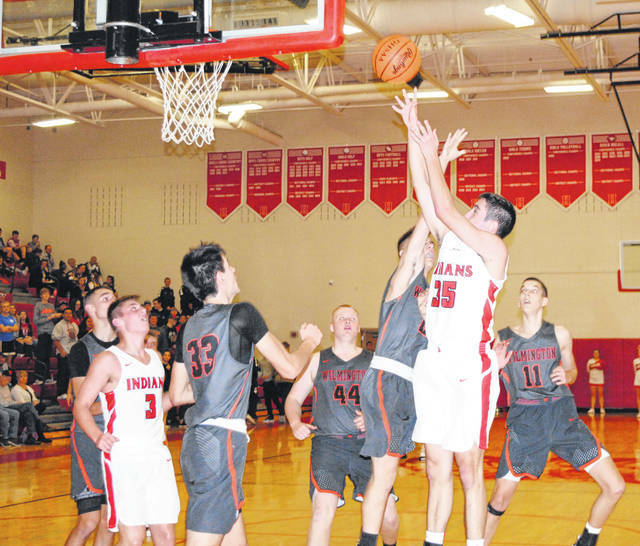 Brad Miller was the leading scorer for the Indians and he finished with 11 points in the game, Ryan Scott was next for Hillsboro with seven points and Mason Swayne finished with six points of his own. Also contributing for Hillsboro were Jakwon Clark, Luke Magulac and Ethan Watson and they finished with three, two and two points respectively. Cameron Coomer led the Hurricane with 17 points in the game and earned Most Outstanding Player honors with his performance that included two three pointers. Steven Sweeney and Chris Custis each contributed 10 points to the Wilmington effort and played stellar defense against the Indians in the second half of action. Marko Anicic finished with nine points and Matthew Butcher had six for Wilmington. Hillsboro will be back in action on Saturday when they take on Maysville St. Patrick at 6:40 in the second to last game of the Ohio Valley Hoops Classic. The action starts early at the OVHC on Saturday with Xenia taking on Walton Verona at 12 p.m.; Moeller taking on Lexington Bryan Station at 1:40 p.m.; Blancherter battles Beechwood at 3:20 p.m.; Campbell County Kentucky will face Walnut Ridge at 5 p.m.; and Moeller will take on Sidney following the Hillsboro and St. Patrick matchup.